It was sunny and there was no wind as I stopped to count 11 cars in the Bowen ranch parking area. When I got to the Freedom trail head there was one car. At the Hunter's camp parking area there were 2 trucks. I noticed the rabbits and a few lizards were enjoying the great weather too. When I got to the springs only @ 25 persons were around. As the day continued @50-60 persons were around. I got into a delightful conversation with some hippy chicks who were camping at Joshua tree before finding out about our lovely oasis. After this about 30 Chinese people got into the anniversary pool w/me. These people thought I was an American beauty and requested I take pictures with them. A pretty little lady said they would not believe this in China unless they saw a picture. She said I looked like God. This was all very interesting so I got my thermometer out to see how the storm from the week before had changed things. The outside air temp was 64. 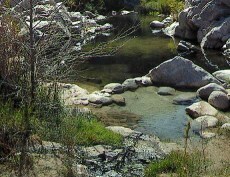 The creek water just upstream from the Arizona pool was 46 degrees this was a 4 degree drop from last week. The Arizona pool had been fixed and was over flowing again.Thanks to whom ever ! It was 106 degrees. The Anaversary pool was nice and clean and 105 degrees. The Womb pool was 98 degrees. The Serenity pool had sand bags diverting the hot water into it from the crab cooker pool so it was 108 degrees. The Crab cooker pool surprised me again. Last week the normally 114 degree pool was 115 degrees. This week it was 116 degrees. Something is going on ? I forgot to take the temp of the Contemplation pool. All temps were taken near the surface and near their center between 1 and 2 pm. Every body I saw was glad to experience this beautiful gem of nature. Please help everyone by hauling out the nitwits TRASH !